Ready for the country scene, the Amish 24" Hampstead Sheafback Stationary Barstool curves and flows with grace. These are solid wood bar stools featuring a "sheaf back" which represents bundled grain that fans out beautifully. Finials top the stool posts and a scooped seat is rich and comfy. Turned legs add to dressing up this stool that's a great match for a country style or french country style kitchen. Enjoy casual dinners at the counter in this country style favorite. Select options online or contact an Amish Furniture Specialist by email or phone. Thank you for shopping with DutchCrafters. 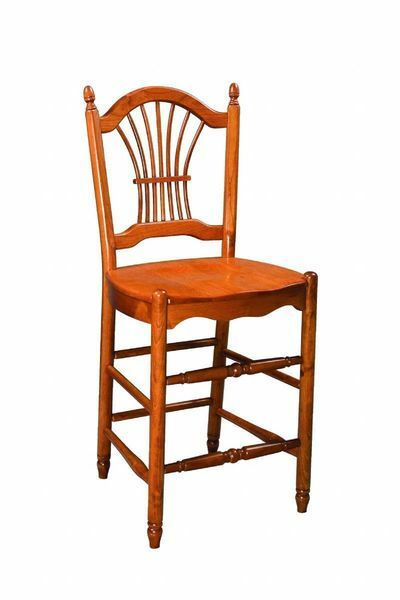 Overall Width from Legs: 20"
Seat Width: Approximately 18 1/2"
30" seat height not available in this style. *Handwoven Fiber Seat - The handwoven fiber seat is similar to a Rush woven style. The handwoven fiber option is more uniform in appearance and more friendly to clothing.